Having read his Armada, I had an understanding that Cline likes to write about future civilizations and historical elements. I had picked up Ready Player One YEARS ago, but I rarely ventured past the first chapter. That changed when I restarted it yesterday, and picked it up before bed last night. And then proceeded to read until I fell asleep and then had dreams laden with a lot of the references or what was going to happen in the book. Needless to say, I was jonesing for a visit into the 80s, which meant I needed to crack open the book, and I am so glad I did. Wade lives in the stacks–at the top of a large pile of trailers and RVs. Well, he’s SUPPOSED to live there, he chooses to spend more of his time in his hideout. That’s where he conducts research, goes to school and devotes most of his free time searching for the answers to the biggest puzzle in OASIS–a set of clues hidden in the game that will allow the winner to collect the creator of OASIS’ vast fortune, and be in charge of OASIS. Wade is known as Parcival, the name is the knight who found the holy grail. No one is supposed to know Wade is Parcival, not even his friend in the game, or his classmates online. The competition has been at a stalemate since the creators death YEARS previously. However, Wade stumbles across an answer to the first clue and sets off on his quest. As he finishes the first clue, he meets Art3mis, who has spent the last few weeks trying to solve the first clue, she’s on the right path, but she cannot defeat the foe. And Parcival is found out moments before he escapes. However, he realizes that his win is announced on the scoreboard and soon he is pelted with offers for friendships, sponsorships and even a job. However, Wade begins to see the sinister aspects of the Sixers, who become more interested in Parcival as he tries to continue the quest to solve all three puzzles. The Sixers are part of a rival organization, the IOI, who wants to monetize and take over OASIS. And when his meeting with the head of the Sixers ends in his trailer blowing up, he realizes he will have to start a new life and hide while trying to find the rest of the clues. But he needs help–but can he trust his in-game friends (and the few non-Sixers on the top five gamer list), or is he in on this all by himself? There were name drops in this–not just pop culture movies and music, but also with icons like Cory Doctorow and Wil Wheaton. And there was a DeLorean that was given away in part of the release that looks VERY similar to what Parcival drives in OASIS. And while part of me found the book’s clues to be a little bit easy to figure out (yes, I am a real geek! ), but there were a few obscure clues that stumped even me. I loved the references and felt a little like a kid in a candy store if I would have had all of that at my fingertips. 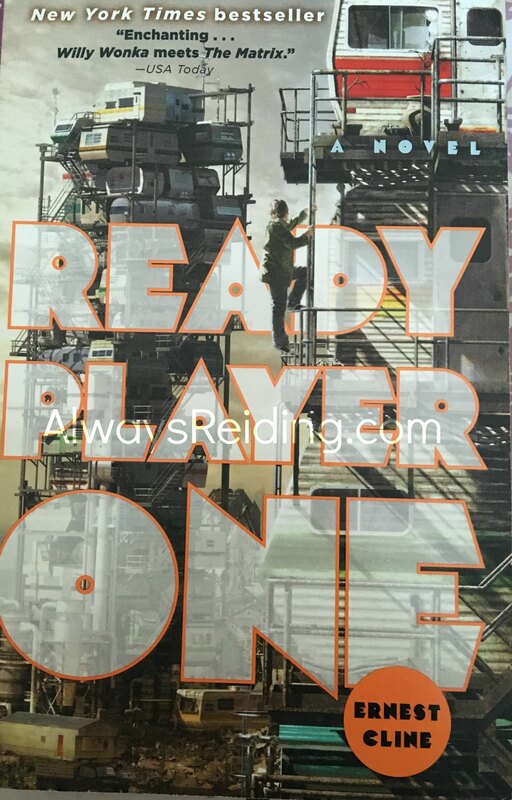 I really enjoyed Ready Player One, but I think it would work for ANY fan of dystopian novels, or novels about geeky things. Even those unfamiliar with dystopian novels would probably enjoy Cline’s writing, especially those into Sci-Fi and Fantasy. You can pick it up in your favorite format (from your choice of retailers) today!